Washington, D.C. — It’s our nation’s capital, home of historical museums, full of beautiful artifacts, and will soon serve as center stage for Hinton Battle’s Danze Off Competition, a new competition and convention. As a three-time Tony Award winner known for his singing, dancing and acting on Broadway and in film, Battle has embarked on this newest project after settling down in D.C. Actors Hinton Battle, Rima Vetter and Charles Ward in a scene from the Chicago replacement cast of the Broadway musical Dancin’. Photo courtesy of Battle. This is where Danze Off plays a key role in furthering dance careers and fostering young people’s overall passion for the arts. 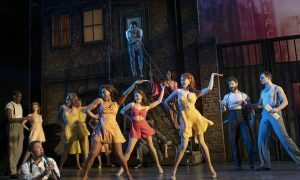 By making its debut in 2017, Danze Off is destined to be the platform that dancers in D.C. would not have had otherwise. From genres including tap, hip hop and spiritual to lyrical, contemporary and stepping, Danze Off will encompass a variety of styles that dance teams can perform at a competitive level. “It’s a way for dancers to come together, take class and grow,” Battle adds. Besides having the opportunity to compete, dancers will also be able to participate in convention classes of various levels to strengthen and excel in their craft. These levels include: minis, juniors, teens, seniors, and pre-professionals. Whether you’re a beginner, intermediate or advanced dancer, Danze Off is equipped to create a welcoming atmosphere for all dancers. Battle has hand-picked a panel of judges who have various backgrounds in film, television and Broadway. Apart from their students, teachers will also have a chance to participate in a private class with the most respected and sought-after star choreographers, thus making Danze Off an experience for everyone involved to enjoy. As the roster of judges and convention teachers are finalized, Battle made a clear contrast of his choices compared to other competitions around the country. By incorporating such a professional caliber of judges into the mix and matching it with great convention classes, Danze Off is primed to create opportunities that will enable kids to be exposed to what the industry has to offer. In return, this gives them a front row seat in the professional world of dance. In the near future, Battle also hopes to award scholarships for dancers wanting to further their dancing career, especially in college. Furthering kids’s dreams is an ongoing point that Battle continues to stand by. This constant enthusiasm is relevant in his goal to “feed the souls of dancers who love to dance and want to take it further”. The future of Danze Off and where it will be after its debut in 2017 can’t be determined yet, but Battle has great expectations for how it will evolve the world of dance and those involved. Touring is one of the many aspirations on the list for Danze Off. 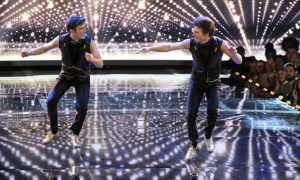 Ultimately, Battle hopes for Danze Off to blossom into an international competition, which would make it a destination for everyone. Battle’s excitement couldn’t be contained at the thought of what is to come. There are great things in store with the introduction of this innovative competition. With Battle at the forefront, the possibilities for Danze Off are limitless. 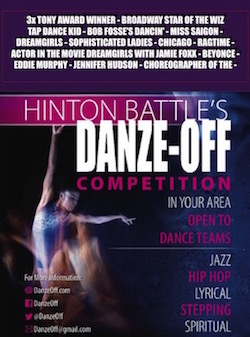 For more information on Hinton Battle’s Danze Off, head to www.danzeoff.com. Photo (top): Hinton Battle. Photo courtesy of Battle.